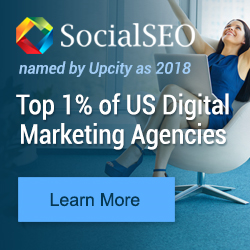 UpCity, the leading marketplace for growth-minded small-to-medium businesses (SMBS) seeking like-focused digital marketing agencies, has announced its 2018 Top Agencies, naming SocialSEO as one of the top 1% of digital marketing agencies in the country. UpCity has become the most trusted, and most turned to, source for local businesses who are seeking digital marketing agencies to meet their expansion and customer acquisition needs, with over 100,000 businesses across 300+ local US markets turning to UpCity to find fully vetted, high quality agencies like SocialSEO. Experts in local, national, enterprise, and ecommerce SEO, social media, and search engine marketing, SocialSEO offers its customers an effective and refreshing approach to digital marketing. The company culture is one of family, where employees are encouraged to foster ideas, and challenged to conduct business with trust, honesty, and integrity, partake in decision and policy making, be solution minded, exhibit positive thinking and energy, and lead by example at every opportunity. Learn more about our Denver SEO, Colorado Springs SEO and Phoenix SEO offices. UpCity is the leading online marketplace that connects businesses with locally-based, qualified agencies and digital marketing service providers. The company provides a comprehensive directory of trusted marketing service providers in local markets across the United States and Canada, as well as across industry verticals.